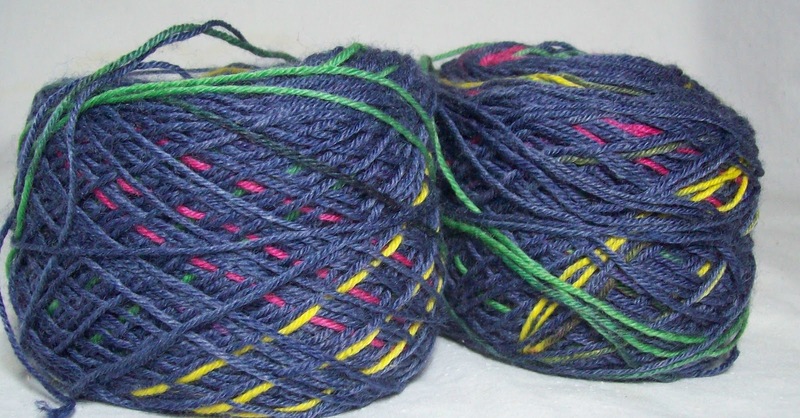 When it comes to selecting sock yarn. Half the time, I end up with colors I love, (but match almost nothing in my wardrobe)--the other half of the time, I buy sock yarn on sale, in colors that don't really send me. Then I don't notice till the socks are knit—how well they match this, and that, and so many things I own. Take the secret sock(just finished) I didn't realize till they were done, that the yarn is a perfect match for a print skirt that I own. Really, if I had the yarn custom dyed to match, it couldn't have been a better match. Now I am thinking about knitting a second version of the secret socks design, in a different yarn, and adding these socks to my personal stock pile! I should look and see if there is more of this yarn available--(There is–in the Smiley's on line store-at twice the price) ... A small scarf would be just the thing—paired with a solid top, it would be gorgeous—except the skirt is getting loose, and do I want to alter it? (And do I want to plan to knit yet another scarf?!) Savvy shoppers might know that Filatura Lanarota is a name Plymouth Yarns uses discounted yarns--(Fashion Toes= Happy Feet)--even the color numbers are the same--the secret socks are color 11. Given that I had to buy 10 skeins, it made sense to buy 2 of each color—whether or not I really liked the colors. (I actually bought more—and shared some skeins purchased with a friend, so I ended up with some extras--3 skeins of color 10 became my Leafy Vine scarf)-Plus I still have 2 more skeins for a pair of socks someday. It happens all the time—I find (and buy) beautiful sock yarn—in PINK (I have so much pink sock yarn from bright pinks to soft pastels, in solids and in prints) and virtually no pink clothing. In CORAL ( I LOVE coral!) Too bad what little clothing I have in that color is summer wear and rarely wear socks in the summer. I have –already—a pair of orange socks—a good six year old and never worn yet.. I have NOTHING in orange to wear with them. But somehow, in addition to the already knit socks, I also have 3 full skeins of orange sock yarn in my stash—OK--so one skein was remaindered, and only $0.50--(and I couldn't pass it up!) but really, more orange? I have several pairs of sock that have some orange in them, too--Like the ROY G BIV socks, or my Mast Socks, or (the list is long! just look at my sock collection on Ravelry!) —So should I ever buy anything orange, I do have socks to match. Not to mention, I have skeins of both the Toffee and Taffy color ways of Sock Ease, both of which have some orange highlights. I am going to have to re-think some of my choices for socks for the coming year. I like having sock that match my clothes—And I already have lots of wild and crazy socks in beautiful colors--but I hardly ever wear them! Even now, while I am excited about my black eyed suzy socks, I have to admit, if it weren't for the green—the sock would match nothing! OK, so this years sock plans included a pair of leafy lace socks in Lion Brand Sock Ease—color green apple—a color I am not really enamored with. It's more a dark olive than a apple green--but green? My wardrobe is full of greens; both muted and multi color greens prints outfits that will go with this yarn. Why do I like green for clothing and think it ho-hum for socks? I also have a lot of blue socks—but not nearly enough to match all the denim that I own—I have blue and denim fabric too, so my new wardrobe will have a lot of blue too, (some green, too, now that I think about it) I have a some blue yarns, too, but some how, it never catches my fancy—Not the way other colors do. The just emptied sock kit bag (that held the secret socks) is going to be stuffed with this yarn. I haven't planned what sort of socks I will knit with this yarn (Reynold's Swizzle/discontinued) but at least I know, cobalt blue will end up being useful socks that go with clothes I own and wear! Come to think of it.. I have two more skeins of Swizzle—one in a neutral light grey, and one in a functional forest green... guess I don't always buy the wrong color sock yarn. Oh, yeah, the Black & White cookie socks? Well they are now 2 inches along (vs yesterday's 1 inch) Not so much different...I photograph them again in a day or two, when the progress is more dramatic. Ok, you've made me officially insane by showing us those Roy G BIV socks and the Lion Brand Sock Ease stuff. I know you are a kind person so it's not your fault.